Did you loved the pinwheel wall from our last feature? Are you already envisioning it as the backdrop at your wedding ceremony? Well .... lucky you because Los Angeles event designer Yoleine Dumarsais takes us through the easy process of making your own ombre pinwheels. Perfect for any party or celebration, this doable diy wedding project will add a major touch of whimsey and some seriously cute eye candy. Read on for instruction on how to make your own ombre pinwheels. A special thanks to Yoleine Dumarsais for this DIY Ombre Pinwheels tutorial. Step One To create a colored wheel for a gradient look or an ombre appearance, paint half (or a little more then half) of your paper. Make sure to paint the end darker and go lighter on the half. Take a piece of napkin or washcloth and wipe the paint to the other half of the paper. Repeat this on multiple sheets to create 1 pinwheel fan. Note: All of your pinwheels do not have to be watercolored you can make some using this technique and some without. For the water-colored pinwheels, I like to use Van Gogh water color paint, and water color paper (water color paper has texture compared to regular cardstock paper). But you can use any kind of water color paint. Step Two Fold cardstock paper accordion-style into 1/2 inch folds. It's good to have different size papers in order to form different sized pinwheels. So you can cut the paper in different sizes. Step Three Fold accordion in half and secure using a glue gun for extra hold. This creates a part of the pinwheel. Repeat this 3 times. 3 fans equal 1 pinwheel. Step Four Punch holes with a hole punch or cut holes about a quarter of an inch from the ends of the pinwheels.You can add as many or little to your pinwheel. This is to make them a bit different! Step Five Use the glue gun to glue your pinwheels to the dowel for extra hold since this will be fastened to your wall. There's no systematic way to glue wheels. Glue wheels at different angles whether it's to the dowel or to another wheel. Make sure to cover the whole dowel! About 7 pinwheels will create a pinwheel dowel for your pinwheel wall. 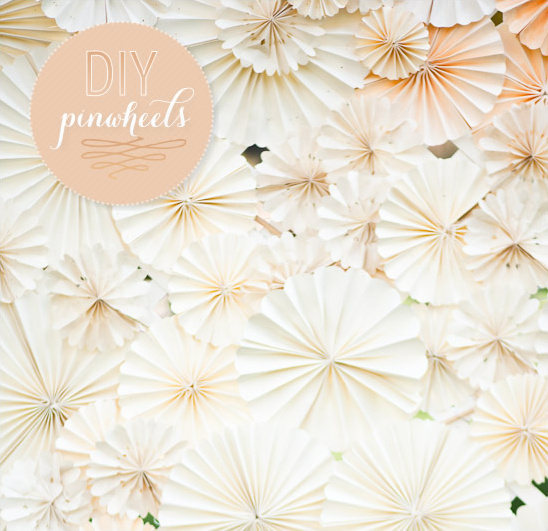 Repeat this whole process 4 times to create your pinwheel wall! For the shoot an 8x4 lattice wall was used to pin the dowels. Place the pinwheels one under the other and fill in empty spaces with an individual pinwheel. It's up to you if you want to cover your wall completely or leave some empty spots!